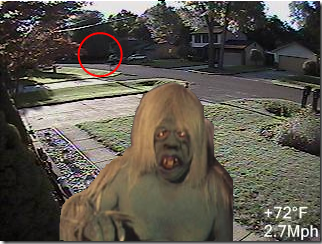 My “friendly” neighbor Atomic has what he calls a gnome cam. 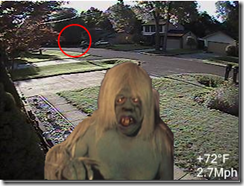 It’s quite simply an all weather web cam that sits outside his front door snapping pictures every few minutes. On occasion the camera catches something interesting (see below) but usually the camera only captures images of a boring driveway. Now the problem with the gnome cam is that, while pointed directly at my house, it fails to get any helpful images of my house. If Atomic’s camera was better, we could see both of our boring driveways and the count of interesting occurrences would at least double. When I moved back into my cave, he didn’t exactly say he was going to get a newer and better camera, but I’m pretty sure he thought it to himself. So in response to his assurance that I’m a lazy Morlock that doesn’t eat enough Eloi, I say, when you have a camera that allows me to more easily see the Eloi as they travel around the cave’s entrance, I’ll chow down. What are you talking about I can clearly see 3 Eloi frolicking in that circle. I can even make out the two pixels that indicate they are laughing at your lack of sirens, sphinx and smokestacks. That is some of the finest photoshop work i've seen in awhile. My hat's off to you Morlock.